Cutting edge: The Evoque looks the part, but is its in-car tech competitive? 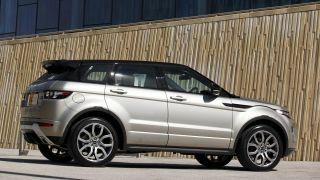 The Range Rover Evoque has been a smash sales success for Land Rover, both here in the UK and across the globe. But does it have the tech chops to match its concept car looks? It certainly packs some novel features in the form of its Dual-View touchscreen and Meridian sound system. Time for TechRadar to investigate. The Evoque, for the uninitiated, is Range Rover's new compact SUV. It's based on the Land Rover Freelander, which in turn uses a modified version of the Ford Mondeo platform. Engines wise, the Evoque looks relatively modest, too, with a range of four-cylinder petrol and diesel units. There are no six or eight-cylinder models nor any fancy hybrid options, currently. That said, thanks to turbocharging, outputs are healthy enough. Our test Evoque is the top Si4 2.0-litre petrol model, which cranks out 240hp. In that context, you could argue that list pricing that starts as high as £40,995 for the Si4 three-door model in Dynamic trim is pretty rum. Indeed, hitting £50,000 with some extras is all to easy. But the Evoque undeniably cuts a premium dash, inside and out. And more than anything, it's a serious head turner. Everyone loves the Evoque. Anyway, perhaps the in-car tech can help with the value proposition. The basics of the Evoque's infotainment clobber involves an eight-inch touchscreen front and centre in the main console. At £600 it's either good value compared to some equivalent systems or a bit rich when you've just forked out over £40,000 for a four-cylinder mid-sized SUV. Functionality covers the usual retinue of in-car features. That means navigation, Bluetooth telephony, audio and video. At least it does if you tick enough options boxes. On top of the £600 for the touchscreen, the HDD Premium Navigation System adds another £1,430. The DVB and analogue TV tuner, meanwhile, is another £510 and the optional Meridian Surround Sound System is another £995. At this stage, you're probably beginning to appreciate how racking up £10,000 of options is awfully easy. That said, you do at least get some standard kit on most models, including Bluetooth, USB connectivity, DAB radio and a five-inch LCD display in the driver's instruments. As we'll see, however, what the Evoque's infotainment isn't, at least not for the most part, is cutting edge. There's no internet connectivity. No apps. No remote services. Without internet connectivity, there's a limit to how fancy the Evoque's navigation system is going to be. There's no HD Traffic service, no Google searching nor Send to Car. What you do get is a pretty comprehensive offline navigation system that supports seven-digit postcodes. What you'd hope for, then, is for something simple but extremely easy to use. At first glance, you get just that. The maps are clean and unfussy and there's a split-screen mode to help you track both your overall position from a bird's eye view while you negotiate a trick junction with a close-eye view on the other side. In practice, however, it doesn't work that well. The refresh rate of the mapping is pretty clunky for starters. And the close-in map can be slow to update and hard to follow. Quite frankly, even a basic aftermarket unit from the likes of TomTom or Garmin is far superior. And far cheaper. But then that's often the case. What you're paying for is the convenience and neatness of an integrated nav solution. As for the POI database, as with most pre-loaded efforts, it's of marginal utility at best. We doubt you'll use it much, especially if someone on board has any kind of smartphone with them for online searching. Settings up Bluetooth on the Evoque is smooth and slick. It not only allows for hands-free telephony, including phonebook support, it also does music streaming, including track data.